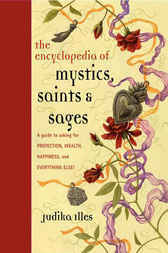 World-class spell collector, fortune teller, psychicpractitioner, spirit worker as well as independent scholar, writer, and teacher,Judika Illes offers acomprehensive encyclopedia of the sacred, helpful mystics, saints, andsages from a large variety of religious traditions who can, whenvenerated, produce miracles for the reader. Illes,author of The Encyclopedia of 5000 Spells and The Encyclopedia ofSpirits, surpasses herself in this peerlessly expansive guide for allinterested in folklore, mythology, and history, as well as those looking forguidance about accessing the power of saints. Illes’sThe Encyclopedia of Mystics, Saints, & Sages is the mostcomprehensive, accessible, and effective guide available anywhere.